Introducing the Ergo-Air Anti-Vibration (AV) Glove. Proudly made in the USA. Protection against against Hand Arm Vibration Syndrome (HAVS) associated with vibration and shock generating hand equipment. Tests conducted at the US National Institute for Occupational Safety and Health (NIOSH) document that the AV Glove meets the strict requirements of ISO 10819 to be classified as anti-vibration gloves. The Ergo-Air patented inflatable air bladder provides the most effective vibration reducing advancement in anti-vibration gloves, is durable and extremely lightweight. The inflatable air bladder inside the AV Glove allows for a comfortable fit and full movement range for the hand, fingers and thumb when operating power tools. Unlike other anti-vibration gloves using viscoelastic, polymerfoam gel and other similiar vibration reducing materials, the AV glove bladder will not break down, bunch or harden with daily and extended use. Made 100% in the USA to meet the requirements for the Berry Amendments, the Ergo-Air AV Glove comes in two styles, mesh-backed and leather backed. The Mesh-Backed Ergo-Air AV Glove is a general work or mechanic's glove where the primary requirement is for protecting the hands from hand tool transimitted vibration. The palm side of the glove is durable goat leather. The back side is a nylon mesh fabric. The finger sections have goat leather fourchettes for greater durability, finger dexterity and overall comfort. The Leather-Backed AV Glove has a goat leather backing for moderately more abrasive and full hand protective work environments. 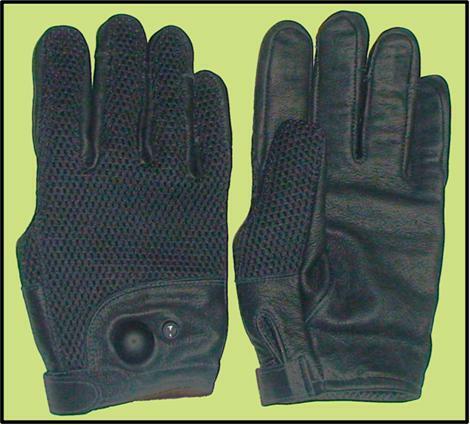 Many glove manufacturers and suppliers in the U.S. market gloves that are claimed to be anti-vibration (AV) gloves. 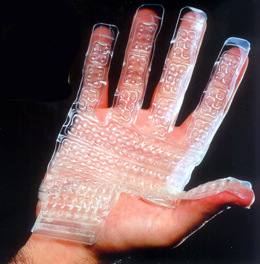 Gloves marketed in the European Union (EU) cannot be marketed as AV gloves unless they have been tested according to test protocols in and meet the minimum performance requirements of ISO 10819 - Mechanical vibration and shock - Hand-arm vibration - Method for the measurement and evaluation of the vibration transmissibility of gloves at the palm of the hand. Many gloves market as AV gloves in the U.S. have not been tested according to nor meet the minimum performance requirements of ISO 10819 to be classified as AV gloves. 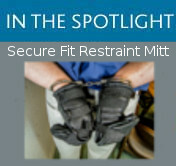 When purchasing gloves for protection against the potential health hazards associate with hand-transmitted vibration and shock exposure, care must be taken to ensure they have been tested according to the test protocols in and meet the requirements of ISO 10819 to be classified and sold as AV gloves. The glove must be a full-finger glove. 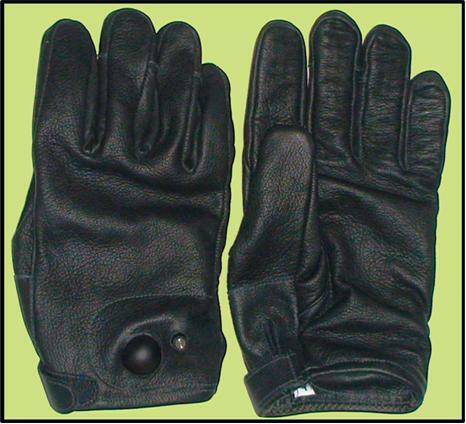 A half-finger glove cannot be classified as an AV glove per the requirements of ISO 10819. The vibration reducing material in the glove must cover the full palm area, the three full phalanges of the fingers and the two full phalanges of the thumb. The same vibration-reducing material used in the palm section of the glove must also be used in the finger and thumb sections. The ISO weighted vibration transmissibility of the glove in the frequency range of 25 - 200 Hz must be less than 1.0. The ISO weighted vibration transmissibility of the glove in the frequency range of 200 - 1,250 Hz must be less than 0.6. The vibration transmissibility is defined as the ISO weighted acceleration value measured at the palm of the hand divided by the associated ISO weighted acceleration value measured on the tool handle clasped by the hand. The vibration-reducing material is placed in the glove between the tool handle and the palm of the hand. 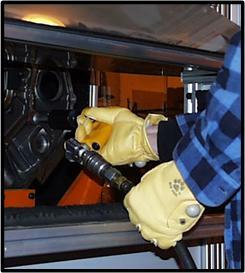 Even though not currently required by ISO 10819, because of potential negative health effects and the potential of a glove to negatively affect the ability of a tool operator to properly control his tool, the thickness of the vibration-reducing material placed in a glove should not be greater than 8 mm.